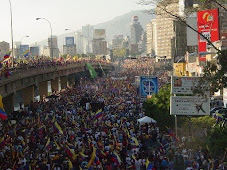 Venezuela News And Views: A January 23 harsh on democracy: RCTV out again and Globovision is the last network in Venezuela to present the opposition views, the rest are pro Chavez or "neutral", that is, silent. A January 23 harsh on democracy: RCTV out again and Globovision is the last network in Venezuela to present the opposition views, the rest are pro Chavez or "neutral", that is, silent. It cannot be lost on the Venezuelan observer that the commemoration of January 23 1958, the date we thought marked the end of our last time under a dictatorship would be the date chosen by our new dictatorship to limit the reach of cable TV and start the process of forcing it to transmit for free all the propaganda of the regime. The day started well enough for freedom. The opposition march outshone by far the chavista one, a tired affair that could not compete in energy and quantity with the opposition march who flooded tightly several miles of avenues. The problem for chavismo is that it did not really celebrate the spirit of 23 de enero. After having tried during its first years to ignore it, chavismo has been trying to co-opt it. But it is not working because not only their heart is not into it, but the 23 de enero does stand for freedom, for end of censorship of all type and chavismo has become a fascisto-commie amalgam, drifting toward an Orwellian world. The opposition did not have such problems to organize its very successful march because it is starting to understand what is it that we really fight about: our freedom and that of our children. the motivation was there, people attended without any need for coercion or payment as it is the case for too many of the red shirts attending Plaza O'Leary this afternoon, listening to Chavez promising that the EXITO expropriation will lower the cost of living. But the day ended very badly as RCTV was forced off the air once again. The government had to use an arbitrary regulation, illegal, anti constitutional on many aspects, creating a short term risk for the cable TV system of Venezuela JUST to remove RCTV from its grid. There are two reasons for such a move. First, since RCTV was forbidden from open broadcast, it managed to reinvent itself through RCTV Internacional and go on cable only mode. Its success was a rather unexpected, becoming there the most watched channel, by far. Since that May 2007 closing of RCTV, cable TV companies have had a brisk business, in particular Direct TV in Caracas poor neighborhoods where courtesy of a pre-pay system its inhabitants could afford a satellite dish and a basic grid whenever finances allowed. Direct TV could manage that because it recycled all sorts of old dishes and decoders and rented them for cheap for people only too eager to escape Chavez cadenas and incessant propaganda on the open air networks. I know that for a fact as my Direct TV installers explained it to me when I switched one year ago to Direct TV Plus and they took my old decoder and remote with them. Officially today cable reaches almost 40% of homes, but through illegal connections the numbers are probably well above 50%. For example Intercable suffers much of that since it is very easy to pass a cable from one house to another. Direct TV requires a decoder per TV, but if two homes agree on what to watch, a single decoder can pass the evening soap opera to more than one humble abode who can split the Direct TV pre-paid card (you pay a card which code you give to a phone number and your decoder is activated for 30 days automatically). In other words, more than 50% of Venezuelan homes can now escape the mandatory broadcasts of Chavez cadenas and that is simply not acceptable for the regime. Not to mention that to add insult to injury, RCTV even on cable alone could occasionally reach ratings close to 20% (or more?, considering how many are illegal takes). The second reason is more obscure. Marcel Granier, the chairman of RCTV and one of its stock holder, has finally come out and said that it rival Venevision is in bed with the regime and wants the demise of RCTV to be able to control all of RCTV market share, in particular of soap operas for which through and with UNIVISION of Miami it is a main producer for Latin America. Before RCTV closing, its soap operas tended to be the most successful ratings wise. Since RCTV is closed, it does not have the means to finance and produce the lavish soaps it used to do and Venevision took at least part of that market without needing to meet quality requirements. Interestingly Venevision+, the "international" version of Venevision has been exempted from the new regulation. It is noteworthy to note that Gustavo Cisneros, Venevision owner, and Marcel Granier are related through their wives families which explains why it took so long to Granier to go all out on Gustavo Cisneros. Granier reminded us that Jimmy Carter promoted a private meeting between Cisneros and Chavez in 2004 and that since then the sellout of Cisneros to the regime has been complete to the point that he and his family are so discredited in Venezuela that they mostly leave outside Venezuela, I have been told. Certainly when the day of reckoning comes Venevision directors, its journalists and editors, and some of its actors and anchors will have a lot to account for as they diligently failed to even mentioned that RCTV was being closed in 2007. Nobody that I know watches the Venevision news anymore and today Venevision has replaced in many state offices the mandatory VTV that was forced upon people in the waiting areas. I rest my case. True, RCTV could accept to pass all of Chavez cadenas and the 70 minutes a week of free propaganda advertisement a week the government demands. But RCTV revenues on cable cannot be compared to those of an open air waves signal. Apparently also the new regulation limits the amount of advertising that Venezuelan producers can show on cable. If to this you add the 70 minutes that RCTV would have to yield without compensation you can understand while this one prefers to go off the air for the time being, as it effectively did on Direct TV (I checked). The aim of the government in the new "regulation" is indeed to shut off RCTV, at least through this year electoral campaign. For that not only revenue would be cut, but an unfair retroactive (and unconstitutional) rule does not give enough time to RCTV to adequate its programming. We can assume that thus for at least two or three months RCTV will not be able to go back on the air and then it would be easy for chavismo through legal maneuvering to delay an eventual return until after September. I did find an example to illustrate this desperate need that chavismo has to censor it all (and surely Globovision closing might not be that far). Monitoring Saturday's march on TV I made this little movie below. In it, I simply switch back and forth between VTV and Globovision. VTV, the state official TV, and Chavez main propaganda alley, has banned from its news and talk shows the half of the country that opposes Chavez whereas Globovision does pass a very significant amount of Chavista news. Although the video is not that great you can still observe what are news and information according to the chavista vision of the world and its well washed brain dead journalists. On VTV all camera takes are from close, rare panoramic takes are done except on Plaza O'Leary where people have been tightly packed waiting for the beloved Supremo who will arrive late, only when he knows for sure that the Plaza is full. No more Bolivar avenue these days! A wonderful implicit acknowledgment from chavismo that even with pay off and coercion they just cannot fill it up anymore. Globovision on the other hand is not afraid of the panoramic takes even if on occasion it might show not tightly packed streets. But observe carefully: when it is not packed it is because people are advancing fast, after the march stopped briefly to allow a cross street through traffic or something, and behind you can see the avalanche of people following. VTV cannot do that anymore. Globovision in fact filmed continuously from at least three distant points whereas VTV was filming close to O'Leary, at least as far as I can tell. And I will spare you comments on the repeated, unimaginative, tired speeches of the tired chavista personalities while Globovision passes a wide array of personalities, old and new. Note: the first voice you hear in the video is the shrieks of Celia Flores, the Nazional Assembly head. That is why Chavez needs to close independent AND opposition media in Venezuela. Chavez needs the media to stop passing the list of his failures and the growing discontent about his abysmal management of the country now that he does not have enough money to buy consciences as freely as he did before. Chavez needs all to stick more or less to the official line. RCTV on cable was free to crudely show everything, including the majority of EXITO workers protesting the take over: in chavista lore all EXITO workers welcomed with open arms the chavista robbery. Globovision is next, but I am sure that even TELEVEN is under lots of pressure as it still tries to show some of the daily protests and current problems of the country. As for the rest of the cable, as people will not go to Venevision who wants to impose on us a Miami/Mexico lifestyle of gossip, expect that as the ratings of non Venezuelan channels soar that Chavez will try to force National Geographic to pass his cadenas. I am in fact looking for cadenas everywhere because studies show that in the households without cable TV, 30% of them chose to turn off TV. These households are mostly in Caracas low economical class neighborhoods. And no one has measured how many of the other household keep it up either because they have it in background waiting for it to finish or they are in a chavista controlled ghetto and like to keep a low profile. Thank you. That is a great report on the situation. Even a white guy in Texas can plainly see what is going on. An election year has arrived and Chavez wants to shut down all opposition media. Is it possible that some remnant of RCTV could produce daily news reports on the web? The video clip you posted shows the night and day difference between a channel that will only show the Chavistas and one that will tell the real truth. Very interesting write up. I remember when they pulled RCTV's license to broadcast over the general airwaves. In response to claims of censorship, the chavistas said "hey, they can still broadcast on cable, the public airwaves should be shared with more channels" even though Hugito had made clear earlier that he wanted RCTV off the air because it was a "golpista" channel. Well, now even the veneer of "its still on cable" is gone. Who knows how long Globovision will stay on. Given Chavez's success in shutting down non-chavista television media, how far behind is an attack on the print media? The opposition appears to be banking on a good showing in the September elections, but I'm sure Hugito is looking at Iran and seen how is buddy Mahmood was able to steal an election and wondering if he can do the same. Of course Iran is not Venezuela, there isn't really a history of democracy in Iran and the ruling government also has religion on its side (although one could argue Chavismo is a religion as well). It is ironic to celebrate the end of the dictatorship era by closing one of the main opposition TV channel. Chavez is not wondering if he can do the same as Iran. He is doing the same and has already started implementing his plan. Every step the government has taken this year, short of rationing, was to fix the elections. CNE gerrymandering, the devaluation, the socialist supermarkets and creating laws to allow expropriation, the RCTV closing, the saber rattling, the pointing the finger at the US actions in Haiti, - all of it was to fix the elections. There is absolutely no "wondering" what this guy is about. His history and his promises of the last ten years proves it all. Great analysis of yesterday. I watched a lot of Globovision yesterday and I wasn't able to put it all together. It's also a lot harder when you don't live in the country. If Globovision goes dark, it will be the saddest day. Most Venezuelans will be living in a new blackout. I read the link to the PDVSA article. That debt is only part. It doesn't include employee benefits, debt owed to the government and a few other things. eluniversal wrote about 5 more channels that are off the air now. Just called my relatives and both channels are working :-? Just wonder what Jimmy Carter and the idiot Un-Holly-Wood celebrities(Sean Penn, Oliver Stone etc.) gonna to say to their Fidel Castro Jr.(Thugo Chavez) friend? According to Marcel Granier they didn't even have an opportunity to consider airing the cadena as it was unannounced and they were not prepared to air cadenas at that moment. Apparently the surprise cadena from Chavez, a very short one, only had the objective of making RCTV "guilty" of not showing the cadena. Oppo can count on David Frum. The BIGGEST joke of the month. Heck, Thugo Chavez couldn't even provide electricity for all Venezuelans. What the hell is this guy talking about? And yes, his buddies, Ortega of Nicaragua and others, what can these guys help to rebuild Haiti? Please DO NOT send Cuban doctors to Haiti. They will show up in Miami shortly after arrived in Haiti. It occurred to me that shutting Globo down might really backfire, and they are already aware of that. Why? Because with even one opposition media outlet going, they can continue to claim the "freedom of speech/media" canard. (Never mind that such freedom is most clearly proven not by being allowed some of the time, but by the exceptions where it is not.) With none on the air, the only explanation is simply that everybody agrees with the President, something which no one will buy into because it isn't true anywhere and never will be. Restrict it as much as possible, yes, but until there's another one that could stand in its stead, I think Globo will stick around. The last comment by AIO i have to agree with.My leftie " friends " here in England still use the freedom of speech/media canard. Good comment AIO.I agree this is a good possibility. It's a total canard, and there's actually an easy way to test it. Ask them how free they think speech is where they live, or you can pick a country led by a (relative - it's all about perspective, and given the type you're talking about, sheff61, this could be a long list) right-wing country leader that they know something about. The U.S. under George Bush was a perfect example, at the time. They'll probably rattle on about how much oppression there is. But they will do so by naming examples of individuals who had specific problems, and not about the number of media outlets which freely criticize whomever is in charge, or whomever is not. Feel free to let tham rail for a while. Eventually, you can point out to them how they are - hypocritically - applying a double standard. If you only want to talke about exceptions, the list in Venezuela is much longer. If you want to note how much free media is out there, the Venezuela list is shorter. You'll only fail to notice if you use different criteria to judge the different places. One standard for both - pick either of the above - and it becomes quite clear. For those who are willing to see. Can they show the cadena's split screen with Chavez on one side, and a cast of celebrities doing a drinking game (ok bad idea since their livers would go in about a week). But they could do a version of the Japanese game show "Hey! Spring of Trivia" where points get racked up when Chavez says things that even surprise the increasingly jaded panel (like the tectonic beam weapon). Yes, I'm being facetious here but I'm also trying to find the hypothetical "corners of the box" by which a station that is clearly being squeeze for income can still be in compliance with such a stupid law, but also be able to have some editorial freedom. Can you show the Cadenas but present clear distain or skepticism for what is being said or must it be totally under chavista control. Off topic, probably, but the Vice President of Venezuela, also the Defense Minister, resigned today for "personal reasons." His wife, "environment Minister Yuviri Ortega, also resigned, the media reports said." This may portend something or, on the other hand, it may not. i am sure that himself will be there with bells on.